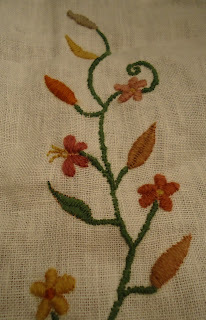 I didn't end up following my original color / stitch plan at all. I found it much more enjoyable to use a variety of treads, especially since the kit offered many color options. Following 18th century pockets as guides, I tried to keep the flower colors balanced on each side. 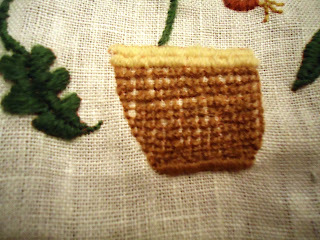 I tried using the Lattice Stitch for the flower pot. 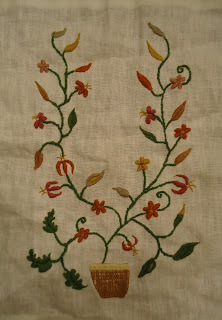 According to The New Anchor Book of Freestyle Embroidery Stitches, it's also called Jacobean Couching. 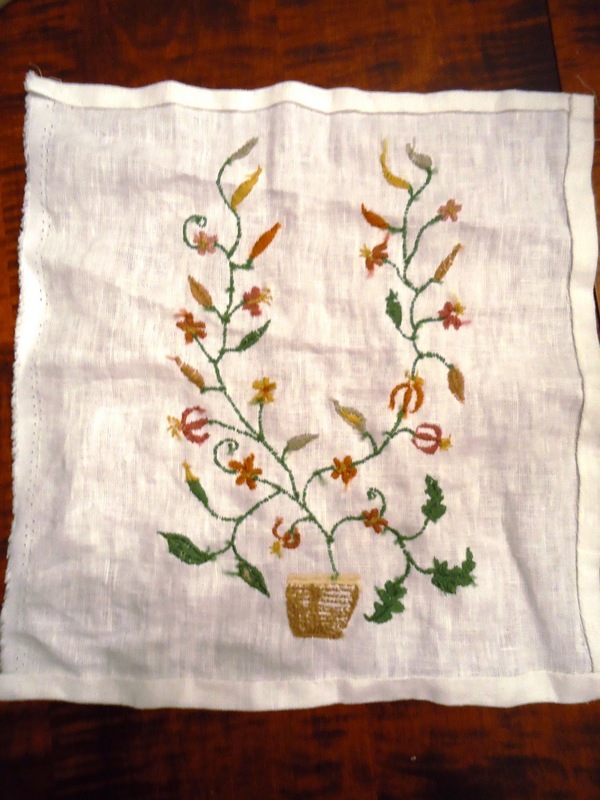 The author describes it as, "a filling stitch that creates an open, basket-weave appearance, which makes an attractive contrast to denser filling stitches such as satin stitch..." (p. 39). Since I used a lot of Satin Stitches for the flowers and leaves, I thought this style would be a good fit. My attempt is kind of a wreck. But I kind of like its lopsidedness. 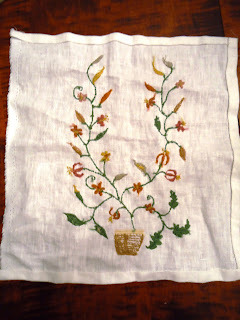 The New England Laid Stitch - this might be my favorite. 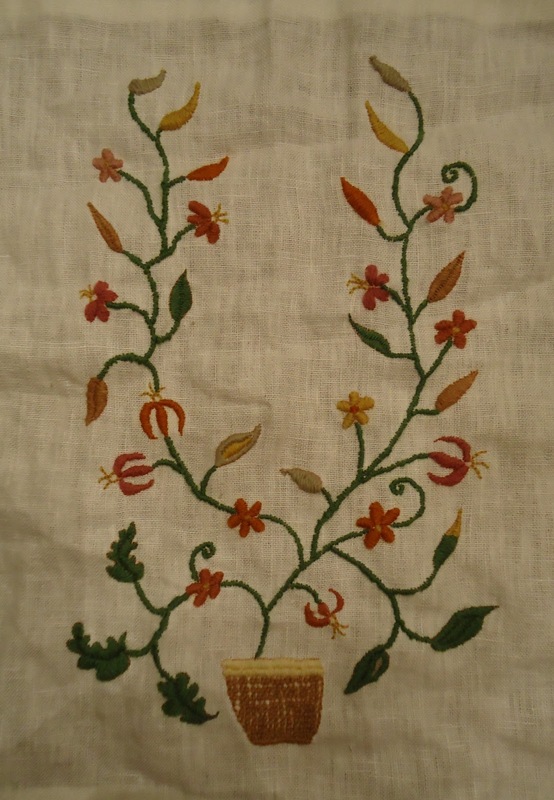 According to The Needlecrafter's Companion: 1001 stitch terms and techniques, I believe that it's also called Antique Stitch, Indian Filling Stitch, Janina Stitch, Oriental Stitch or Romanian Stitch. I used Backstitches for the top of the flowers. 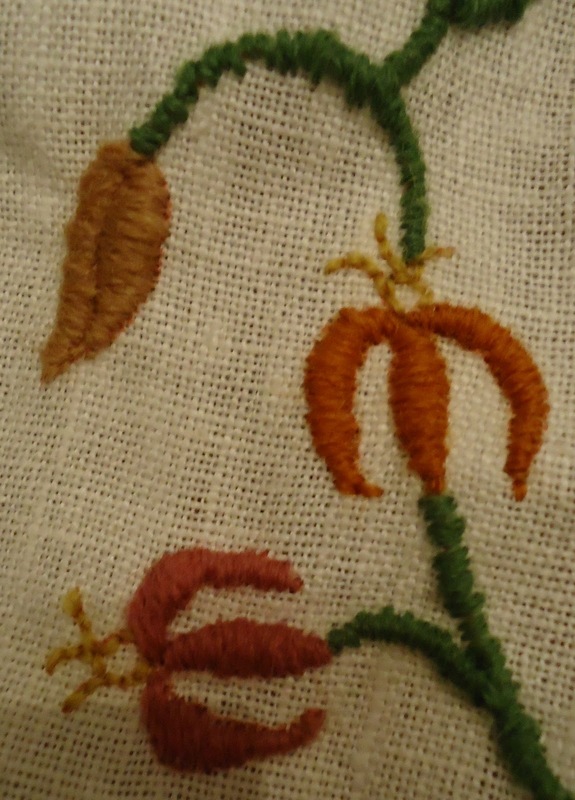 I tried making French Knots for the center of the flower but my thread refused to knot. 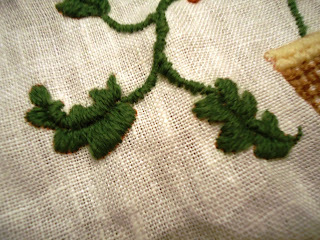 My Stem Stitches for the stems need work. The Needlecrafter's Companion advises that, "When [Stem Stitches are] worked correctly, there should be a neat row of Backsitch on the reverse." Oops! At least the petals are pretty. And a peek at the messy back. To improve: next time use a hoop. (Yes, Mom, you were right.) 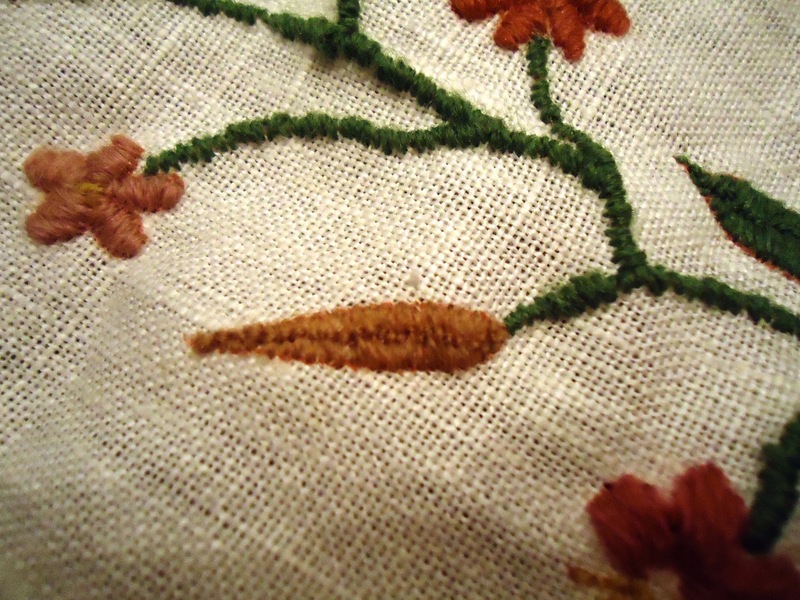 My fabric is a bit puckered / uneven at spots, especially around the flower pot and it seems likely that this could have been avoided if I took five minutes to find my sewing hoop. Overall I think it's not too bad. 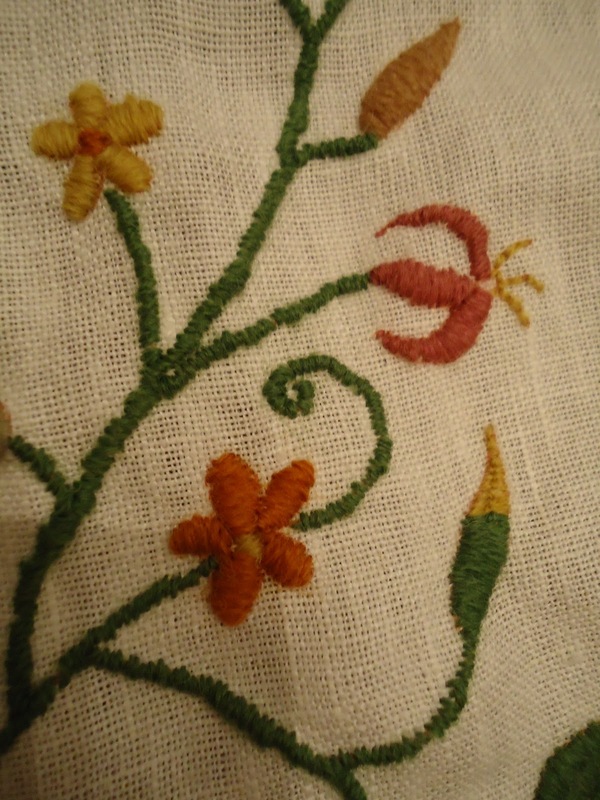 Up next: using my fab fabric find to make a stellar pocket.